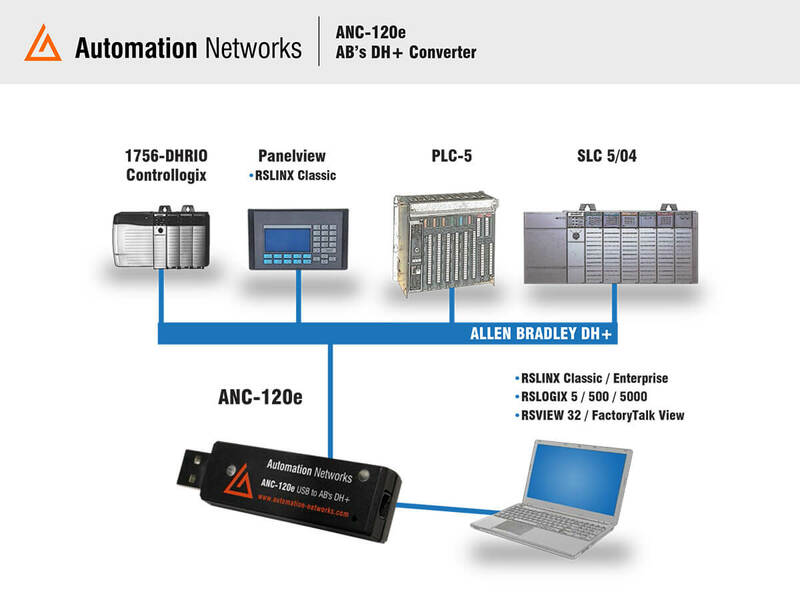 The ANC-120e is an economical and high performance USB-to-Allen-Bradley Data Highway Plus converter interfacing major HMI, SCADA, PLC Programming packages to Devices on DH+. Its features significantly outperform AB’s 1784-U2DHP PLC Programming Cable operating at 12 Mg USB speed with the Controllogix Ethernet/IP Driver. 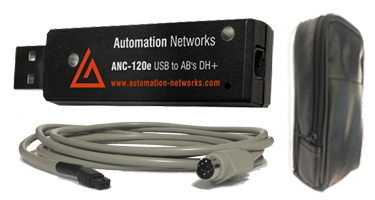 The ANC-120e works with all SCADA, MMI, PLC programming packages installed on your PC with USB direct access to the DH+ network and stations. These packages include RSLINX/LOGIX Classic & Enterprise with RSLOGIX 5/500, Wonderware DAServer & TCP/IO Server, Citect, and Kepware using Controllogix Ethernet/IP Drivers. AUTOMATION NETWORKS IS A TECHNOLOGY COMPANY PROVIDING A WIDE VARIETY OF QUALITY INDUSTRIAL ETHERNET CONVERTERS AND OTHER PRODUCTS FOR COMMERCIAL & FACTORY AUTOMATION. We connect with popular Ethernet & Fieldbus Industrial Protocols / Networks including Allen-Bradley’s Ethernet CSP, Ethernet/IP, DeviceNet, Data Highway Plus (DH+); Siemen’s Profibus & Profinet; Schneider Electric Modbus RTU & Modbus TCP/IP. Other Industrial protocols & Networks includes CC-Link, BACnet MS/TP, BACnet/IP & MELSEC. Citect 2016 ANC-100e & ANC-120e, using the HMI feature with the ABRSLINX500 driver for Ethernet/IP Communications to a SLC 5/04 on AB’s DH+ Network. Citect 2015 ANC-100e & ANC-120e, using the HMI feature with the ABTCP/TCPIP driver for Ethernet/IP Communications to a SLC 5/04 on AB’s DH+ Network. Thank you Shawn from theAutomationblog.com for positive comments of our ANC-120e. Below is his 24 minute video reviewing the ease of setting up this 1784-U2DHP Alternative. “Now you may be asking yourself why the folks over at Automation Networks would release a USB to DH+ converter when Rockwell already makes the 1784-U2DHP? 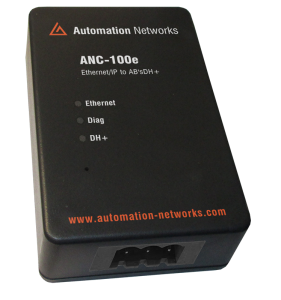 The Automation Networks ANC-100e communicates with all SCADA, HMI, PLC programming with direct Ethernet/IP access to the DH+ network and stations. ANC-100e has similar replacement features as the Controllogix 1756-DHRIO / 1756-ENBT, and AB 1784 Interface Cards: 1784-U2DHP, 1784-KTx, 1784-PKTx, 1784-PCMK and Prosoft AN-X2-DHRIO Converters. 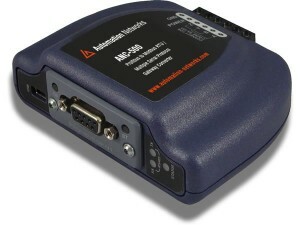 The ANC-300e has the combined performance as an Ethernet and RS-485 serial converter. The gateway behaves like a protocol converter/translator that allows difficult data interchanges and connections between incompatible networks. The ANC-300e is an easily configurable Ethernet / RS-485 converter gateway, that provides integrated communication between all the above common industrial and commercial communication networks and provides a common platform which is convenient and easy to setup in all products. The Automation Network ANC-300e Ethernet & Fieldbus Gateway Converter allows data to be seamlessly transferred between Ethernet to Ethernet and Ethernet to RS-485 networks with simple configuration. $525 USD List. PLC-style logical, arithmetic and filtering database manipulation operations allow the construction of complex autonomous data conditioning functions. The Automation Networks ANC-700 is a Modbus Master/Slave Gateway to DeviceNet (Slave) which allows information to be transferred seamlessly between DeviceNet and RS-485 networks with minimal configuration requirements. The ANC-700 converter provides a DeviceNet port (5-conductor pluggable terminal block style) and an RS-485 port (4-wire terminal block style ). The converter has the flexibility to choose Modbus Master/Slave as well as other RS485 serial protocols.